The vent was a void. A black, echoey void that seemed to stretch interminably ahead. Almost snug on the shoulders of the women who had "volunteered" to go through the vent to try to find help, it would be enough to make most people at least a little claustrophobic. Metal on all four surfaces, there wasn't a chink of light that could be seen ahead, only the faint glow from the mess hall that they were leaving behind. The only sounds were from the mess, save for the odd click or clang as the ventilation system did its job - or not - in the rest of the mountain. The air, although still, was clean and without aftertaste. In the dancing glow of the flashlight, Elvria could see ahead, but could see nothing that indicated a junction. Approximately ten feet ahead on the left wall was a massive fan, clearly what kept the air circulating. Ten feet further on, on the right, was another fan. This carried on as far as the eye could see. Elvria was not sure what she expected to find once up in the ventilation system, she had thought there would be some kind of enemy to identify, maybe some kind of light to lead them in the right direction. But there was nothing, nothing what so ever except darkness, emptiness and if Elvria was correct lack of noise. She was sure that the ventilation system should be louder than this, it should be pushing air along, but there was nothing, it became more pronounced exactly what these machines did to keep a person alive when they were not on. She felt Parnell give her more energy once more, released his grip on slowing her system down, there was only one other person up the place with Elvria and well Parnell knew he could relax a little more now there was less people. Elvria was grateful for such a thing, but she also knew that it would not last long, they had to get moving and quickly, before she herself became unable to breath properly. It was a good job that she was not afraid of the dark, had never been scared of the dark – although she was sure that after this she would have a healthy respect for the darkness – as all she had to see was the glow of the flash light. That seemed to do nothing but illuminate about couple of feet in front of her, enough for her to make out something on the left hand side and enough to see that it was nothing but a straight line. Elvria turned to Ruth as the red head joined her in the vent, she had heard the woman's question before hoisting herself up, but had not wanted to answer it in the presence of the others. She was still unsure if she should answer it now, would it serve a purpose? Would it slow them down? Make Ruth worry? It was not something Elvria wished to burden the woman with, also there was no way of knowing if Parnell would take over if she fell unconscious and that would cause more worry. She turned back around and began pulling herself through the tight fit ventilation system towards the first fan she had spotted. Elvria really hoped that in their quest to do this, the system did not come back online because she was sure that if it did they would not stand much chance up there. Elvria's voice was "off" as she said that she was fine, and, as they edged further into the vent, Ruth had concerns about the smaller woman. Yes, she had a Tok'ra inside her, a Tok'r who was more than capable of doing far more than the average human, Elvria's body was delicate and almost frail-looking. Coupled with Parnell's odd behaviour in the mess hall, Ruth was more than a little worried. "What was Parnell doing back there," she asked, making an arrow mark on the floor of the vent. There was no way that she was going to risk getting lost in the venting system. "He slowed down your respiratory system, right?" It had looked as though he was pushing their body to the brink of death, in order to... she had no idea in order to what. Maybe he had been trying to conserve oxygen or something, even though one less person breathing would only have made a difference of a minute or two, if there was no air coming into the mess. There was a faint breeze floating down through the vent, and Ruth relished its coolness. Clearly, there was still airflow, but something had stopped in the mess hall. She crawled forward a few feet, the faint light from the mess hall dimming ever more until it disappeared altogether. "You feel that breeze," she asked, wondering whether she was imagining it. Elvria should have known that someone would have picked up on what Parnell had been doing, although it did not surprise her that it had been Ruth that had noticed. Out of everyone that had been in the Mess Hall, Elvria knew Ruth the best, was what the Tau'ri classed as a friend - despite the sometimes grumbling that came from Parnell when she said such a thing to him -. So no it did not surprise her that Ruth picked up on the subtle nuances of the change between herself and Parnell, or the fact that Parnell had been consicpicously quite for the past few minutes. No one else had noticed for that Elvria was eternally grateful, she did not think she would be able to explain Parnell's actions to everyone in the room. Not without them thinking it was selfish. Elvria lowered her head slightly, watching her hands as she pushed her self forwards toward well wherever it was they were going. "You are right, that is what he is constantly doing. You must understand he can slow the respiratory system, almost put the host body into a...a sleep state. More air for the rest of the people back there to figure out how to get out." She stopped crawling forwards for a moment, resting against the metal of the square corridor they were currently occupying. Although it was dark in the vent, Elvria turned to look at Ruth, she could just make out the ouline of the woman behind her. "Please understand it is his way of helping in a situation he did not think he could offere assistance in. He is as stubborn as some of the solidiers on base," she said, hoping that Ruth would understand at least partially where Parnell was coming from. Or at least that she would understand that Elvria had tried to stop him, had told the symbiote off for doing such a thing, but for how long they had been blended together, no matter how much they got along with each other. Parnell was still as stubborn as the day she had first encountered him. "I apologise for his actions if he worried you or if anyone else noticed, it was not my intention to worry people," she said, an apologetic smile on her face, despite the fact she knew Ruth would not be able to see it. Turning back around she carried on crawling, really wishing that the Tau'ri clothing she had worn that day was tougher on the knee area. Although her body could heal quicker due to Parnell, in his current state she would no doubt bruise and heal as the Tau'ri people did before he was back to full form. At Ruth's next comment, the comment about the breeze Elvria closed her eyes and crawled more towards it. It felt nice and cool, almost as though she was stood on the outside on the top of the mountain taking in the relaxing air of Earth. "It feels like the outside of the mountain," she commented more to her self than anything. It had been such a long time since she been outside of the mountain, such a long time since she had walked amoungst the Tau'ri people. Maybe, maybe after this she would be allowed such a leave once more? Elvria crawled further towards it, flash light bouncing off the walls throwing odd shapes of shadows as she did so, further and further towards the air she could feel. Pass the giant fan that was sat silent on the left, towards the one on the right. Ruth could feel Elvria working up to an answer to her question, as they crawled slowly along the vent, the only noise the shuffling of their hands and knees and the occasional squeak of the Sharpie on metal as Ruth marked their path. It was almost as though the air became charged, perhaps with something that Elvria might not want to say. Ruth couldn't be sure, at least not until the other woman started to speak. However, the fact that Ruth's suspicions had been correct didn't really instil her with confidence. "There's no need now," she said, her voice emphatic. "That breeze we feel? It shows that the airflow into the mess hall hasn't stopped. It must have been something else." She wondered what it could be. She knew from her basic orientation that there was a filtration system as well as the standard aircon, so maybe it had been that system that had failed. Ruth almost bumped into Elvria as the Tok'ra woman stopped abruptly, and she took the opportunity to make another mark on the floor of the vent. "I understand," she replied, nodding, even though she wasn't sure that Elvria could see her in the dark. "And it's appreciated." Her voice became a little more serious, careful to talk softly so that their words didn't echo back through the vent to the others in the mess hall. "But... you're both of more use conscious and well, you realise?" The skills and knowledge of the Tok'ra could well be invaluable in defeating whatever enemy they were facing, and if Parnell had willed himself and his host into unconsciousness, who knew what would have happened? "Honestly, there's no need to apologise," Ruth asserted. "I don't know whether anyone else would have noticed anyway." Everyone had been focused on their own tasks, and Ruth, as one of the few in the mess who didn't possess a useful skill when it came to getting out of the sealed room, had merely been people watching. A bad habit of hers, in most cases. This time, though, maybe it had been of use. As they started to crawl again, Ruth smiled. Elvria sounded almost childlike as she compared the cool air to being outside. "Yeah, it's cold enough," she remarked. "I guess the air conditioning would draw directly from outside." It made sense, anyway. They passed two fans, and Ruth squinted, frowning for a second as the flashlight bounced off something up ahead. "Is that the junction," she asked. Realistically, that was all that it could be. "I wonder if there's a door or service hatch?" A junction would be a good place for a service hatch, at least in her opinion. "You see anything?" Elvria was appreciative that Ruth understood where at least partially Parnell was coming from. She also understood what Ruth meant about them both being more useful awake and conscious than slumped over somewhere. This was all stuff she knew, it was all stuff Parnell knew as well, but it had not dissuaded him from his goal at the time. Now though, now that Ruth had said out right that there was no need for Parnell to carry on doing what he was doing, Elvria knew the message had been relayed. Parnell had been slowly feeding her more and more energy - for lack of a better word - since the two of them had climbed into the ventilation system. Although he was still no where near ready to 'emerge' for a quick chat, she could hear his voice in her head once more, there was some rather more choice words he would like to add but Elvria kept them to her self. "But what else in the mountain makes such a noise?" asked Elvria, still continuing to crawl forward. She was glad to know that whatever had locked them in the Mess did not want to kill them, that would have been pointless, but that meant they were locked in there to be kept out the way. Which did not go over very well with Elvria or Parnell. "If it was not the air, maybe some kind of cooling system has been turned off? Instead of suffocating everyone they will turn the heat up a little, is what I think you would say," suggested Elvria, trying out the saying. It was always strange to hear a Tau'ri saying come from her mouth, the Tok'ra were not always known for there one-liners. She still got the odd look when she did manage to get one correct. "It has been a while since I have been outside," Elvria admitted, "If this is what outside feels like currently, then it is pleasant." She had never really noticed the subtle changes of Earth's changing weather pattern. There had been people she had spoken to that had complained of the weather greatly, but it was not something she herself had become accustomed to. Elvria tried to shine her own light in the direction it had just been when Ruth said she had seen something. She wondered vaguely why it was always difficult to find a certain place again. It took her a second to find it, fumbling slightly as she switched the flash light from one hand to another, she could just make out the edge of something different about the way ahead. She smiled before scrambling towards it making the light bounce more, as she approached it, she realised it was a junction. Left or Right, two options, the flash light seemed to bounce off the sides as she flicked it both ways. "I am certain this is where most of the Tau'ri say we should split up," said Elvria smiling, knowing that there was no way going to be any splitting up at that moment, or at least she assumed there would not be. Ruth kept her eyes on the silhouette in front of her, the dancing light from the flashlight making anything else difficult. Elvria seemed to be moving with a little more fluidity, a little more comfortably now, and for that, Ruth was grateful. She wouldn't really have known what to do if Elvria collapsed, aside from going back. That would get them precisely nowhere. Shrugging, even though she knew that Elvria wouldn't be able to see it, Ruth shuffled a little futher into the vent. She made another mark on the floor. "I don't know," she admitted. "Seeing as there's some sort of airflow, at least we know they won't run out of air. Maybe it's a colling system, like you say, or it could be a purification system or something?" It was another supposition which was pointless, but still... It wasn't their job to suppose, though. It was their job to get help to the mess hall if at all possible. The thinking could be left to those people in the mess hall who would be able to get the doors open and free themselves. Ruth grinned into the darkness as Elvria admitted that she hadn't been outside for some time. "God, no, it was damn cold this morning when I came in," she replied, giving a mock shiver. Fall was definitely turning to winter, and it was often dark when she came to the mountain, and dark when she left. That was if she left at all, instead sleeping in her lab or on-base quarters as often as not. "This is honestly one of those days when I'm grateful to be inside, no matter what." Of course, she hadn't envisaged these circumstances, so she was starting to reconsider her position on that. The light from the flashlight bounced around until it eventually settled on the back wall, illuminating the left and right branches of the junction. Ruth almost spat as Elvria reminded her that they had been told to split up. "I don't think splitting up is the right idea," she admitted. "Together, we stand a better chance if anything goes wrong. Separated... well, if something happens to one of us, nobody might find out for ages." That wasn't a risk she wanted to take. "What do you think? Separate or not? Left or right?" Elvria looked left and right a few more times, before shining the flash light back at Ruth - not high enough to shine in her eyes of course, but enough so Elvria could see her face -. Elvria had not really ever been asked to take lead on such things, a lot of the things she helped out at on the base were medical in nature most of the time. Tok'ra seemed to live healthier at times and some times that can be transferable to non hosts. Then there was the times when she was acting as liaison between the Tau'ri and the Tok'ra them times she was delivering messages back and forth. She had to be a certain kind of person between both of the higher ups on them missions, which was why she left them mostly to Parnell. He often did most of the delegating between the two species. So when Ruth asked which way, it stunned Elvria for a moment, she had expected the red head to take charge, she was of Earth more than Elvria ever was going to be and had assumed she would decide. Turning the flash light back to the front of her, mainly so Ruth would not be able to see her face - sometimes getting emotional was not something Elvria liked people to see - she said, "Together, we stay together, as you say separating means if we get hurt it will be bad." Of course that still did not answer the question on which way to go, Elvria had no 'gut feeling' as the Tau'ri would say on which way she should go. There was no in bedded instinct for her to choose a direction to continue on their quest for help, then her mind stuck on something Ruth had said, about coming into work that morning. "From which way did you come from this morning to get here?" she asked, which ever direction was answered Elvria would lead that way. After all she had made the decision to stick together it was only fair that Ruth made the other one. Ruth blinked a few times, adjusting to the light shining in her direction. It took some getting used to, even though they had only been crawling through the darkness for a few minutes. She couldn't see Elvria's face to try to work out what the other woman was thinking, and she wondered why she had turned the light back in her direction. Elvria, in fact, sounded almost relieved that Ruth had suggested they stay together, almost as though she was scared. This was something she had never seen from the Tok'ra, a vulnerability that she hadn't realised was there. Elvria might look delicate and fragile, but there was a rock solid courage and a spine of steel hiding behind the girlish facade, and that was something that Ruth admired. "Together it is," she affirmed, nodding, and blinking again as she caught the flashlight right in the eyes. She was taken by surprise, though, when Elvria asked her which direction she had come from. Ruth frowned for a moment before answering. "Uuuuuh, you mean from the gateroom to here?" She took a few seconds to orientate herself, her eyelids fluttering closed as she mentally traced her footsteps, then compared it to roughly where they would be. "I got into the mess hall from the left," she said, nodding, certain that she was correct. "That was after coming up six floors in the elevator." Ruth thought for a second. "That means... if we're going to try to head back to the control room, heading left is the way to go. The vent is on the opposite wall to the main doors, so... That would be right. And we need to try to go down, if we can't get out onto this level." "Left it is," agreed Elvria nodding her head in agreement. Although how much of that Ruth was able to see was not clear to her, in that moment she really wished that somehow the Tok'ra could see in the dark. The advantages that would be able to give to her people, it would be a new era for the Tok'ra if that was to ever come true, she could almost imagine just exactly how much of an advantage that would give them. She herself had gone undercover on the odd occasion that Parnell's knowledge was needed, it had been difficult for her on them missions. She was a young woman who had known only the rather nice captivity of a Goa'uld mother ship and then being a host to a Tok'ra. But she had rallied herself, took her cues from Parnell and they had survived it together, that was what she was going to do now, except this time there were other people to think of. One or two of them she classed as friends, the others although only mere acquaintances she would not wish them to be hurt whilst waiting for the two of them. She pushed her self towards the left hand side of the split ventilation system, it was not something she had ever foreseen herself doing when she pledged her own allegiance to the SGC. 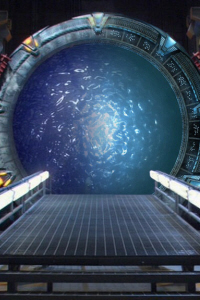 "There is one good thing about the Goa'uld and there ships," Elvria commented as she crawled further down the tunnel, the light back to bouncing around as she crawled, "They do not have such things as these ventilation systems. It is easier to get around on a Mother ship then these current conditions." Of course she knew that the Goa'uld had little use for such things considering no one really put up much of a fight against them and there for they didn't need to worry of that security risk. Which again was an advantage to a Tok'ra even in the smallest of amounts. She listened as Ruth said they needed to find a way to go down, Elvria some how doubted that they would be able to go down without either leaving the ventilation system altogether or without them accidentally stumbling across a rather big drop. Either was not too promising to Elvria and not something she wished to experience either. "Do you think we shall find anyone waiting for us once we have reached the end of this system?" Elvria asked, wondering just exactly what was going to be waiting for them.